Love, Life & Locks (London): Did I? Yes I Did! Did I? Yes I Did! So... with the recent hair blues and all, I decided to do something different. I have always considered changing my hair colour but was afraid to do so in case it led to hair loss or scalp problems (given my sensitive 'hair' disposition ROFL!) Given that I babied my hair as much as possible and I STILL ended up with that dreaded hair loss - well, I figured that if my hair was determined to leave my head - it might as well do so in STYLE! My sister - well noone even remembers what her original hair colour is LOL. She's been 'natural' for over 20 years though and her hair looks like this. We applied colour to the ends ONLY! Didn't want it anywhere near my scalp (for obvious reasons). 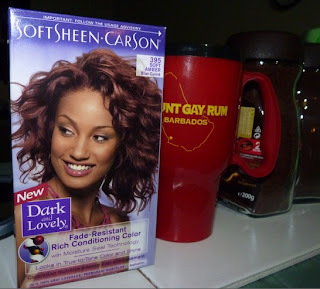 The product did contain ammonia - but although I knew this would cause dryness, I used it anyway because my research showed that when you want a lighter colour, hair dyes WITH ammonia are more effective. ps HRH hates it. No surprise there. I like it. I have actually been thinking about coloring my hair darker, but want to wait for a bit since my last color was in May. Anyways, good job. How's baby? @ Alaiyo & FullRoller: going darker was my other option and I actually bought a 'natural black' just in case I didn't like this colour and wanted to cover it! re@colouring - just be warned, your hair may feel ridiculously dry afterwards EVEN if you deep condition. I'm not liking the current feel but things could always be much worse. BajanBaby is 4 months old and as fat as a cherub lol. She's loving the sun in Barbados - what a shame we only have 2 weeks left! Aww only 2 weeks left??? ... my turn to KMT!!!! boo hoo who da heck sorri fi yuh! Jealous much? who me? LMAO!! yeah come back soon! Love the colour, thank you so much for this info, I not colouring for now! don't do dry! The color came out nicely. It's so scary to color though, but you did a great job.